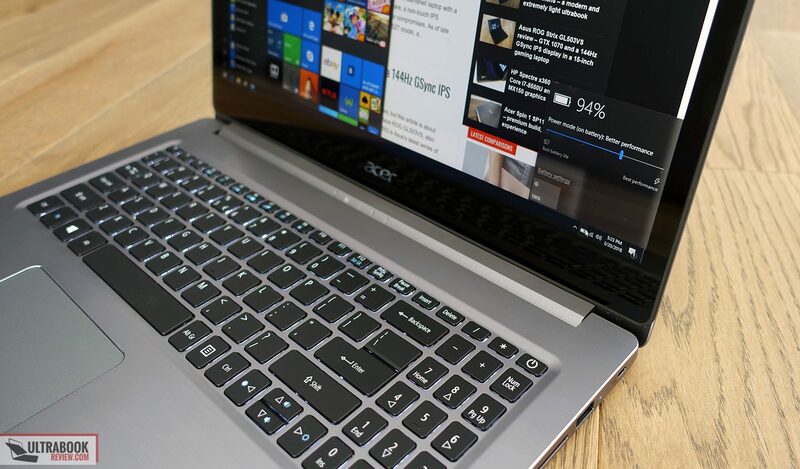 If you’re in the market for a mid-range all-in-one laptop capable of handling everyday chores, multimedia content and occasional games, you surely came along the Acer Swift 3 series by now. 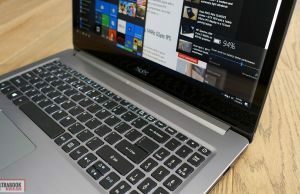 This article is about a newer addition to this line built on AMD’s River Ridge Ryzen hardware. 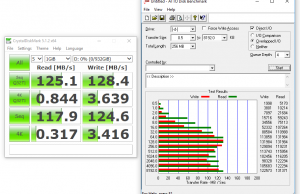 Compared to the Intel KabyLake-R / Nvidia alternatives that we discussed in previous articles, this one offers, on a quick glance, slightly better multitasking performance at a slightly more affordable price. 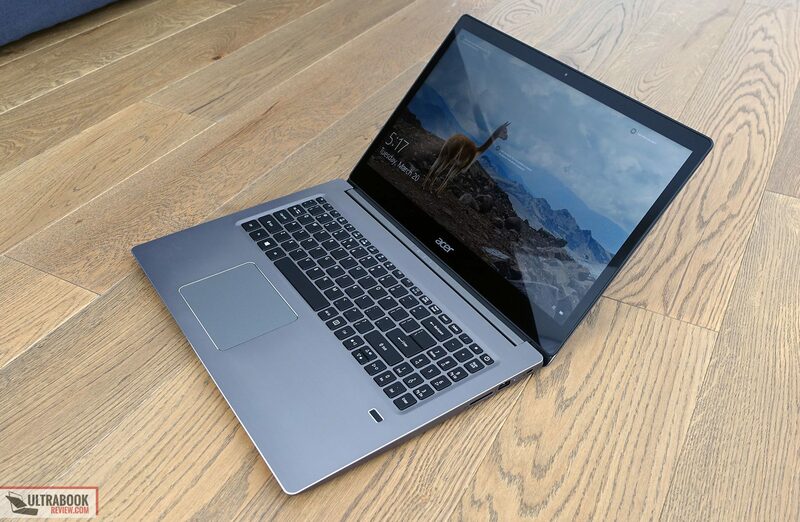 Out test unit comes with the Ryzen 7 2700U APU, the higher end variant available on the market, paired with a FHD IPS screen, 8 GB of RAM, dual storage options and AMD Radeon RX 540 dedicated graphics on top of the Radeon Vega 10 Mobile graphics integrated within the APU, so it’s a bit different from the units you’ll find in stores in most regions, which lack the dedicated graphics. Rest assure though, we’ll talk in depth about the performance of both these chips in the dedicated Hardware and Performance section, although due to the nature of this sample we won’t be able to draw final conclusions, that’s why this article is not a review, but only a collection of impressions. Read on for the whole story. We’re not going to focus much on this part of the article, as the Swift 3 has been around for a while and there are plenty of articles and videos about it online. 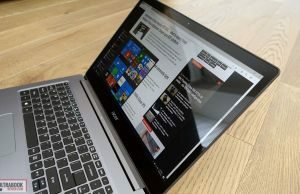 As a side note though, the AMD hardware is only available on the 15-inch chassis at the time of this article, so if you’re looking for the smaller 14-inch variants you’ll have to opt for Intel hardware instead. 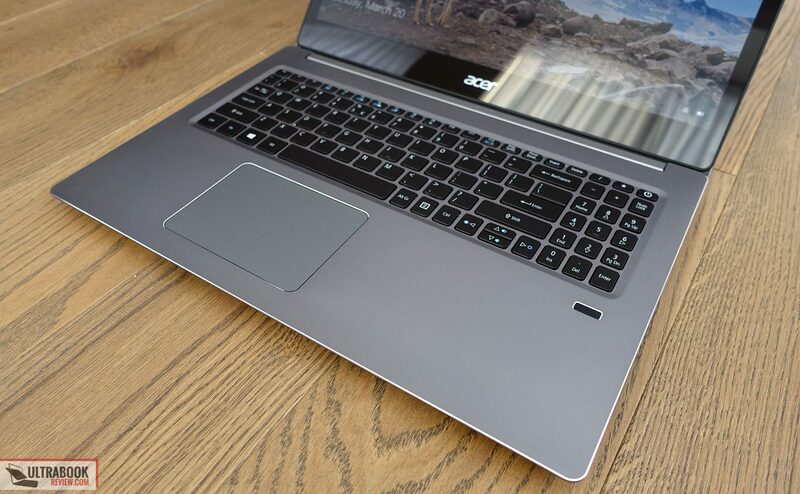 The laptop is built pretty well, with a mix of brushed metal on the outer lid cover and interior deck, paired with some softly finished plastic on the sides and underbelly. 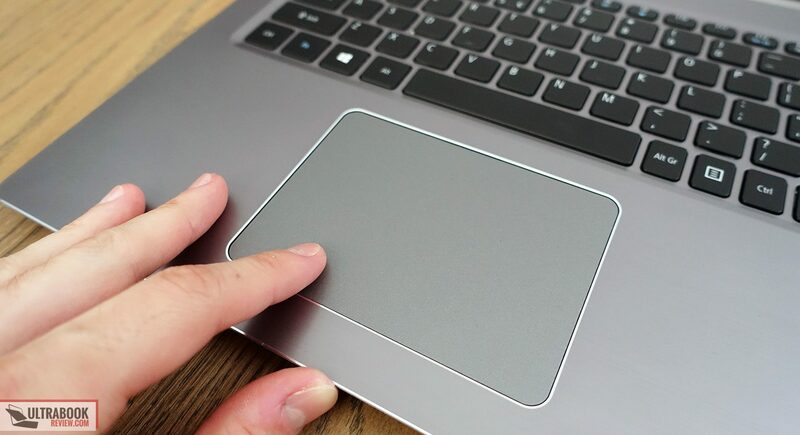 There’s some flex in the keyboard deck, but not to the point where this would feel flimsy or have an impact on the typing experience, so given the price range this competes in ($750 to $1000), I’d say there’s very little to complain about the craftsmanship. 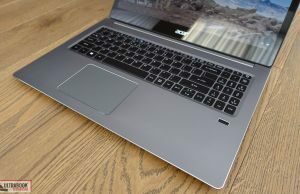 This 15-inch Swift 3 is also fairly light at 4.75 lbs in this configuration that includes both a HDD and an SSD. 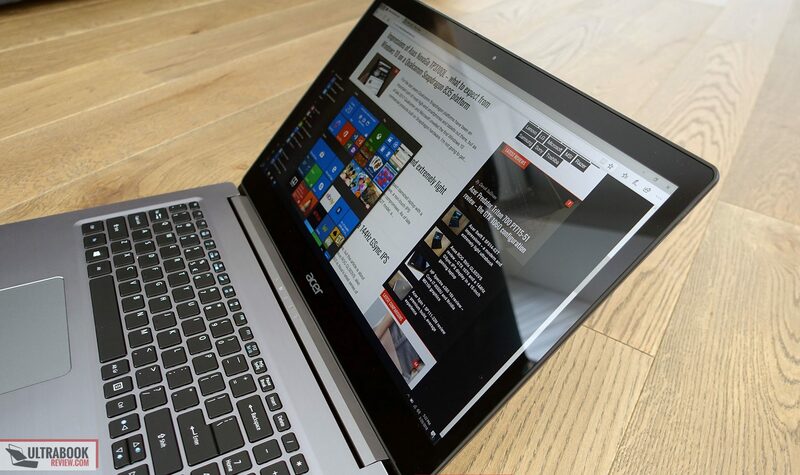 It’s not that compact though, as you can tell from the bezels around the screen, so if portability and a small footprint are your main concern you’ll rather find them with other options. 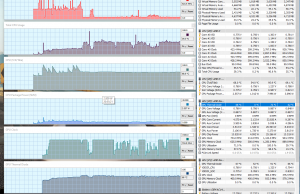 On the other hand this is a fairly practical computer. 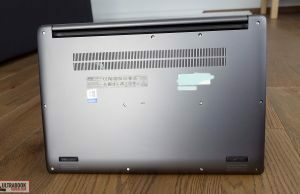 The screen attaches to a long solid hinge and goes back to 180 degrees, the rubber feet on the bottom hold the notebook well anchored on the desk and the IO on the sides provides all the standard ports you’d expect in this segment, with most of them lined on the left side and out of the way for right-handed users. 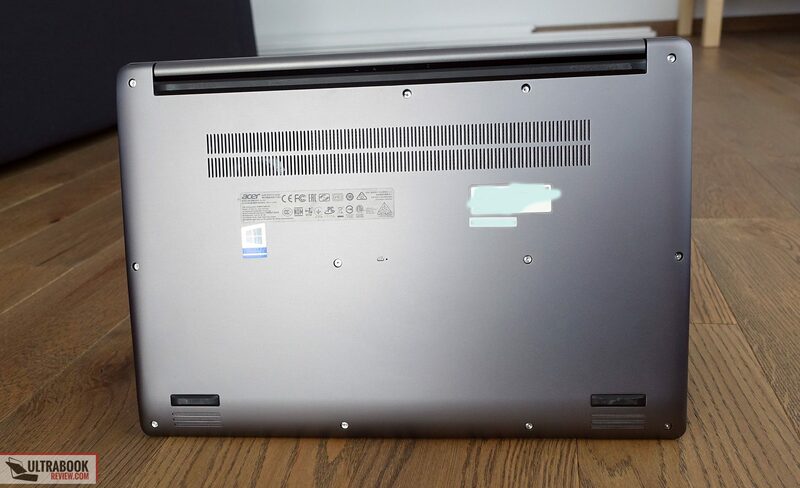 My only gripe is with the sharp beveled edge around the inner frame, which can bite into the wrists when using the laptop on a narrow desk, but overall this has a low enough profile to partially negate the issue. There’s also the fact that the screen gets a layer of glass on top, although it lacks touch, but more about that in a further section. 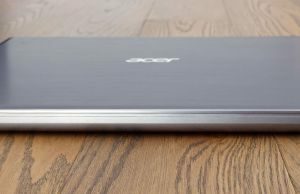 All in all the Swift 3 is a fairly well built laptop with average traits and looks. 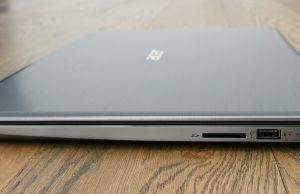 It doesn’t stand out in its segment, but it doesn’t get any significant cave-eats either, which is mostly what I’d expect from a mid-range laptop these days. 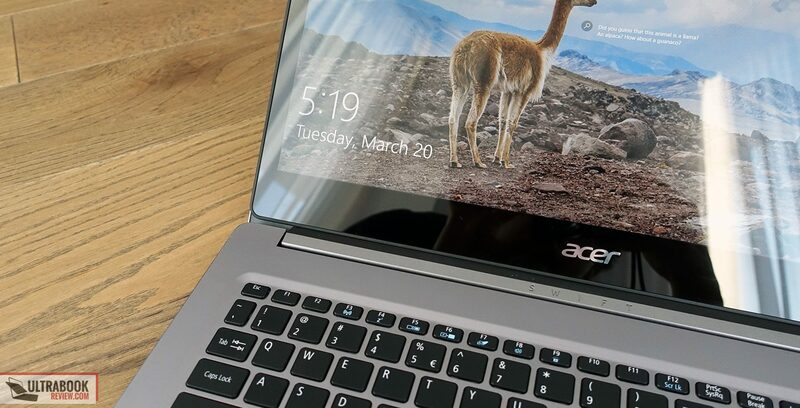 As mentioned earlier, the 15-inch Acer Swift 3 gets an IPS panel with fairly chunky bezels and a layer of Gorilla Glass on top. It lacks touch, so you’re only getting extra protection, but end up with glare and reflections in well lit environments, which is a trade-off I’m not fond of. Some of you however might prefer this over a matte screen. 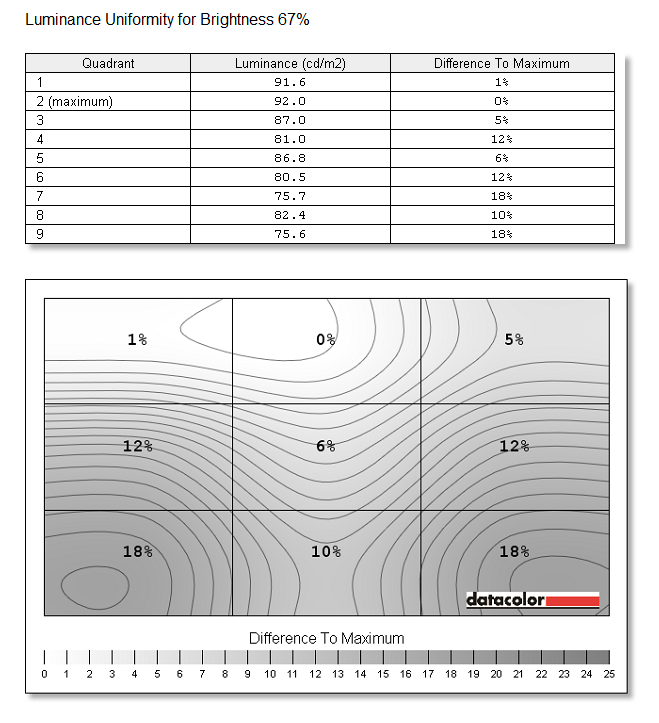 Average DeltaE: 1.77 uncalibrated, 1.24 calibrated. 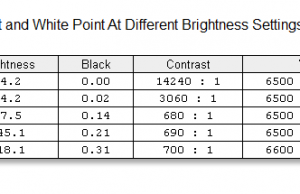 This is definitely not the screen to use for color-accurate work (the calibrated color profile is available for download here though), but it will do fine for everyday use and movies. 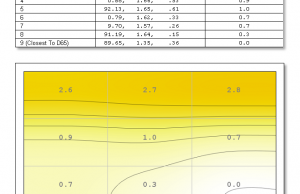 It’s worth adding that this panel uses PWM for modulation at all brightness levels except for 100%, but at high frequencies, so it shouldn’t bother you in real use. 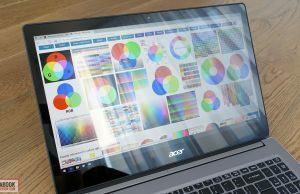 On the other hand, you should be aware that you’ll seriously struggle to use this in bright offices or outdoors, due to the low maximum brightness and that reflective layer of glass on top of the panel. 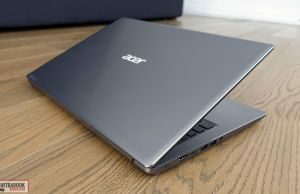 I’m pretty happy with the typing experience on the current Acer Swift laptops and I’d expect most of you to find them good enough as well. I was able to type fast and accurately on our sample, with little accommodation time required. 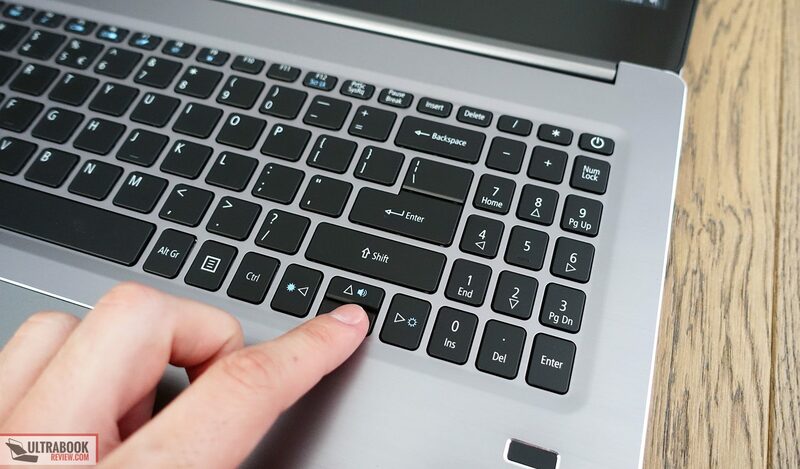 The keys have a short stroke, but a precise click and good feedback. 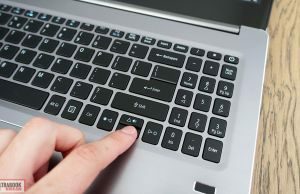 The keys are also backlit, with a single level of brightness to choose from, but the illumination is only activated by hitting a key and not by swiping the fingers on top of the clickpad, like on the higher tier laptops. 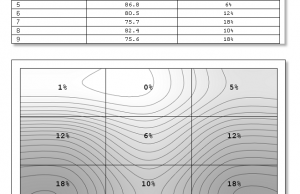 I do have a couple of issues with the layout though. 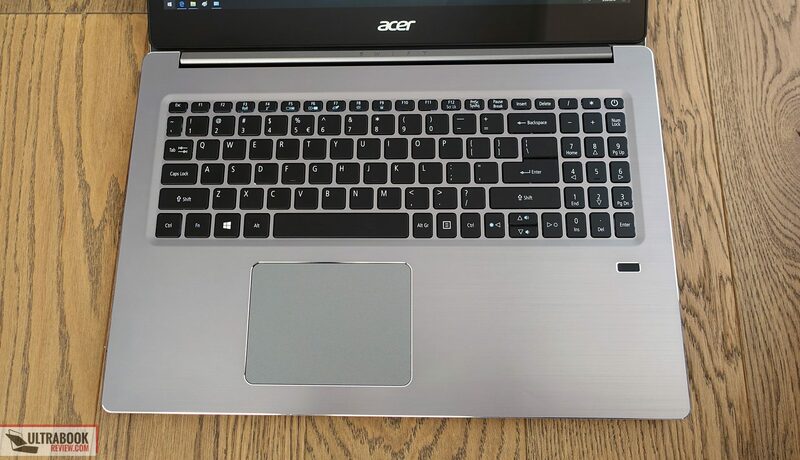 The main-typing area is mostly OK, but Acer includes a very narrow NumPad area with the Power Button integrated as the top-right key, and the UP and Down arrow buttons are short and will take some time to get used to. 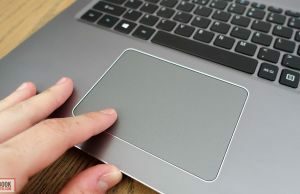 The trackpad is made out of plastic, but is well sized and works well with swipes, gestures and taps. 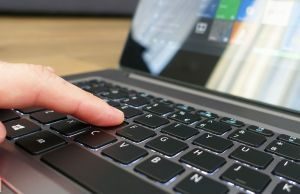 It’s a Synaptics surface with Precision drivers, so one of the better combos out there, as long as you can accept the higher friction of the plastic build, compared to the smoother glass options out there. Even the click buttons are pretty good, albeit a little stiff. 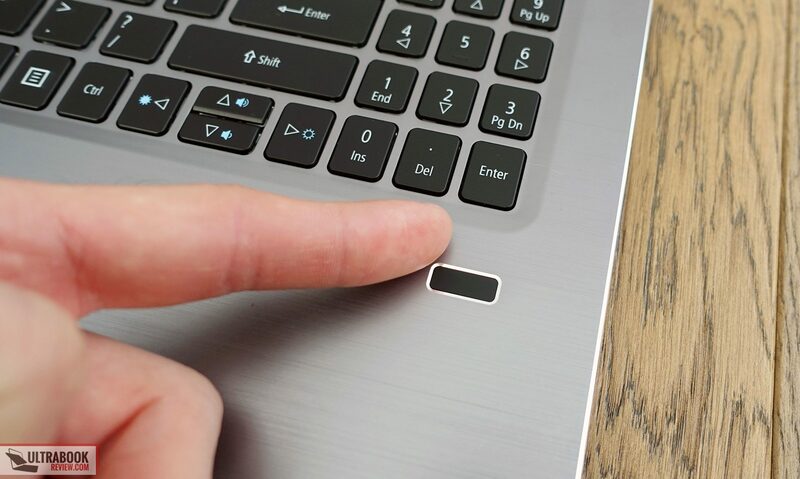 Acer also integrates a fingerprint sensor, which helps to quickly login to Windows without having to enter the password all the time. 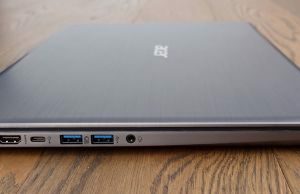 But let’s get to what really sets this laptop apart from the crowd: the AMD hardware. Our test unit comes with the Ryzen 7 2700U APU, 8 GB of DDR4 dual-channel memory and dual-storage, as well as dual graphics: the Radeon Vega 10 Mobile integrated within the APU and a dedicated Radeon RX540 chip, with the ability to seamlessly switch between them when required. If you’ll open up the laptop you’ll notice a few things. 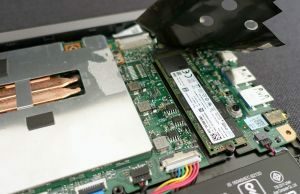 First of all there are two storage drives, an M.2 PCIe SSD and a 2.5″ HDD. 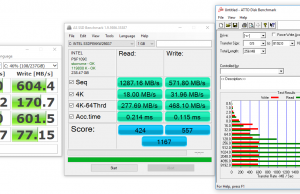 Acer opted for the Intel SSDPEKKW256G7 SSD which is slower than the other PCIe options out there, but that shouldn’t be a significant issue for most users. 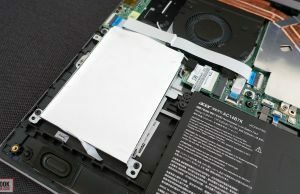 You should be aware that if you’re buying the laptop without the 2.5″ HDD you probably won’t be able to add one yourself, as several sources report that those units that only ship with the M.2 SSD lack the required connectors for the 2.5″ drive. 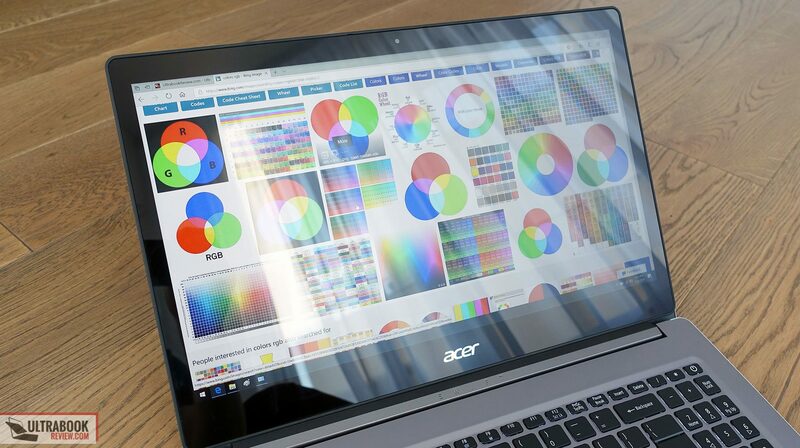 That’s a cheap tactic for Acer if it actually proves to be true. 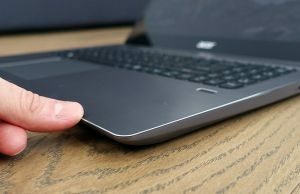 You’ll also notice that the RAM is soldered, so there’s no way to add more than 8 GB of memory, which can be a deal-breaker for some potential buyers. 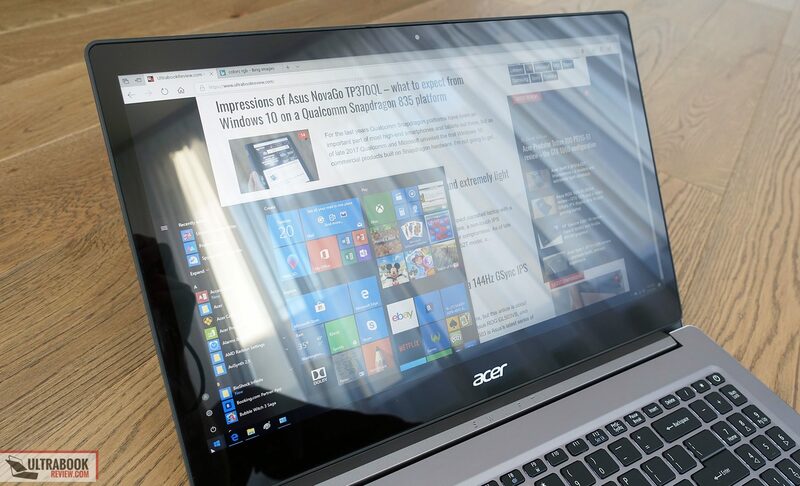 Acer does not offer configurations with 16 GB of RAM at the time of this article, although the hardware supports 16 GB of RAM, so you’ll have to live with only 8 GB of RAM that should be enough for daily use, but might not suffice for some of the more demanding loads. And the thing is, this AMD APU is meant to thrive over the existing Intel KabeLake-R i5s and i7s in multi-core performance. The Ryzen 7 2700U APU gets a quad-core dual-thread CPU with a 15 W TDP, so a match for the Intel Core i7-8550U CPU. 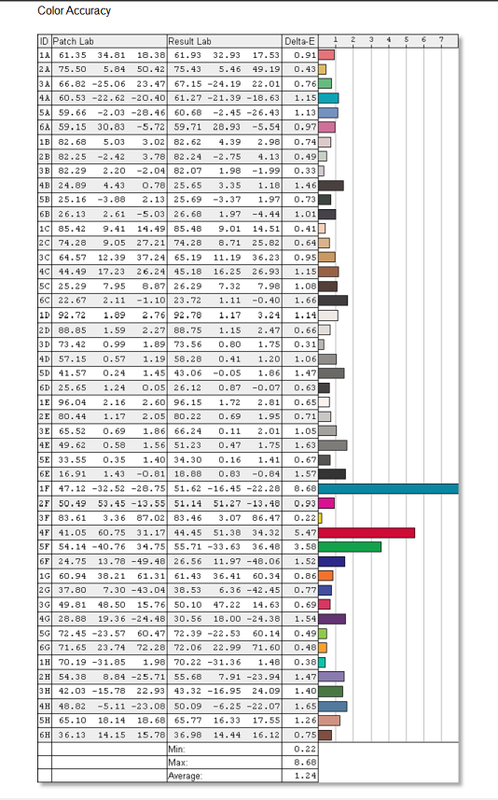 We’ve added some benchmark results, but keep in mind our sample is still early and these numbers could vary based on drivers and implementation. 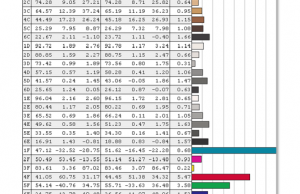 The results are contradicting and it would be hasty to draw any conclusions based on this sample alone. 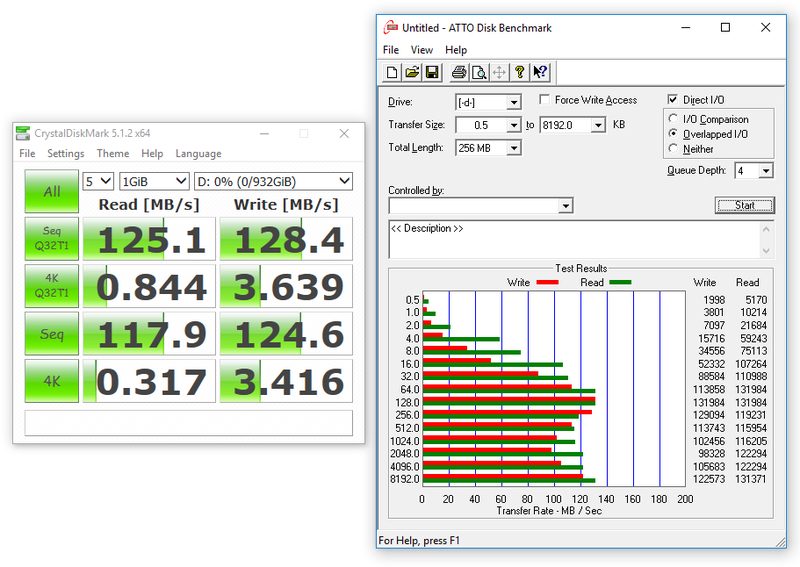 The AMD APU outperforms even the Intel i7 in the Cinebench R15 multi-core test, but then trails even the i5 in Geekbench and x264. 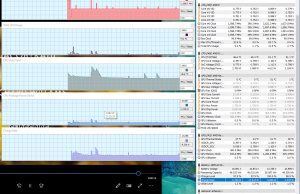 As with most thin and light laptops, the Cinebench score drops when running it in a loop (604, 595, 592, 560, 554 and stabilizes around 530 on our sample), as the CPU’s frequency drops when the core reaches temperatures of around 90 degrees Celsius. 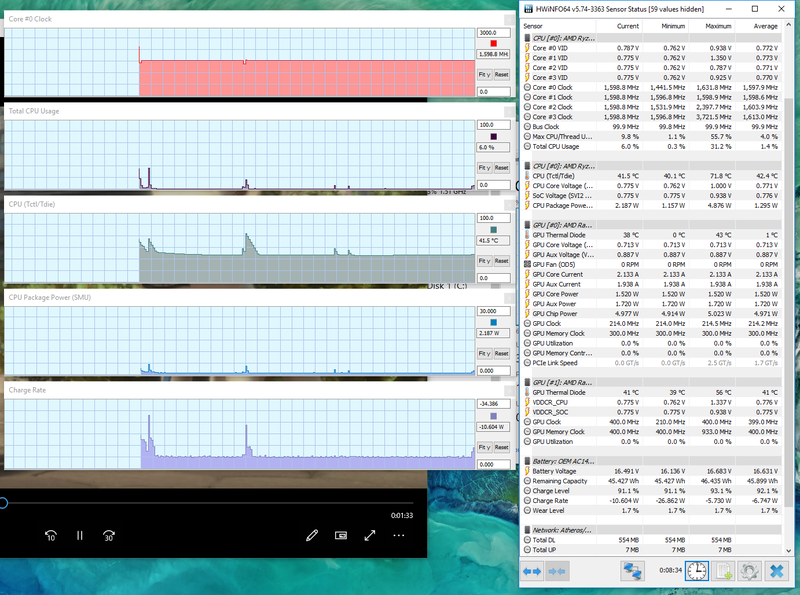 It’s worth noting however that our sample only draws around 11 W in Cinebench, which means it should score better if it were to run at the designated 15 W TDP, at least in theory. 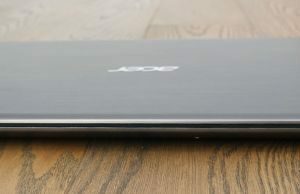 Based on the very few other reviews of the Razen APUs available online, these are capable of matching the Intel quad-core i5s and i7s in most tests, even if our sample does not suggest that. 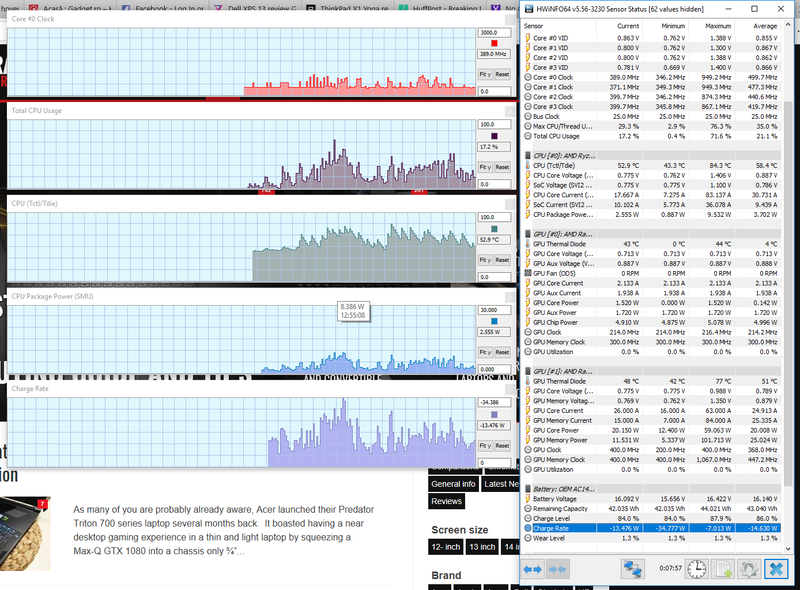 Still, here are a few more benchmark results we got here, just take them with a serious lump of salt. 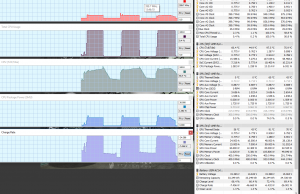 x264 HD Benchmark 4.0 32-bit: Pass 1 – 107.27 fps, Pass 2 – 28.72 fps. 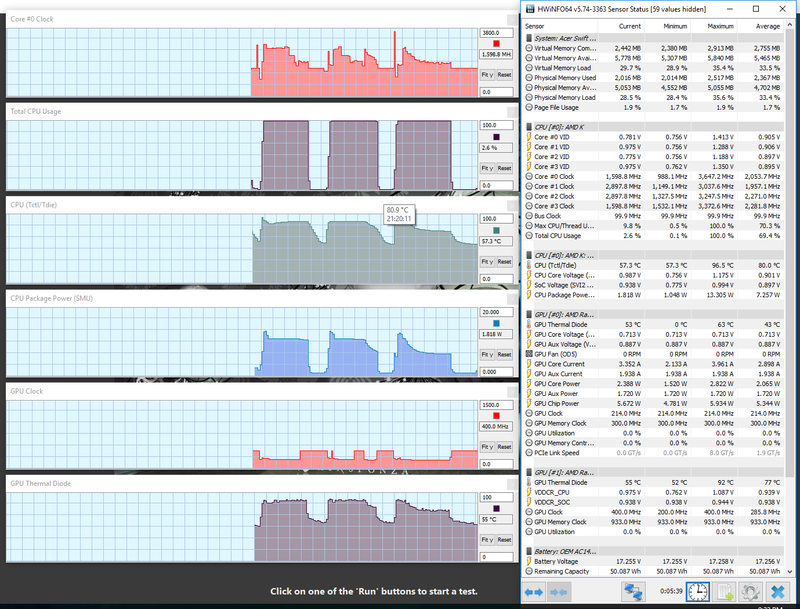 The MX150 results are based on the Swift 3 configuration with the Intel Core i7-7500U CPU and Nvidia MX150 graphics tested a while ago. 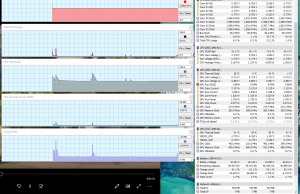 Based on the HWInfo logs and the results above, the CPU throttles aggressively (picture below) while playing games on this sample and hence the graphics results are skewed. 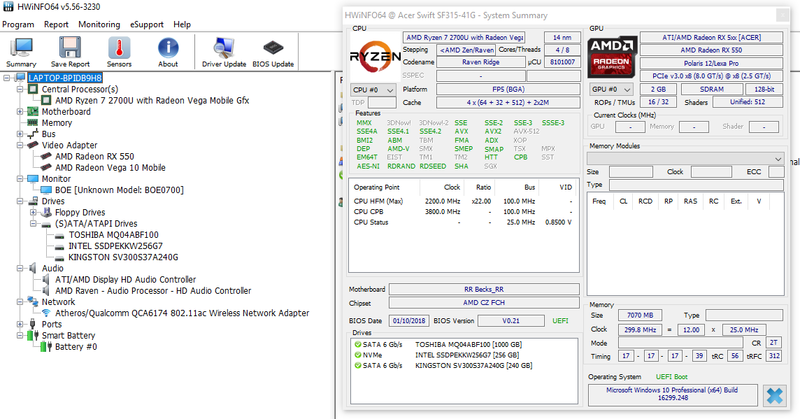 With the RX550 disabled, the CPU does not throttle as badly in games, but the Vega 10 Mobile chip clocks down after a few minutes (picture below), which means this sample cannot offer useful gaming results in any of the two situations. As a side note, given that most configurations of the Swift 3 are available without the dedicated chip and just the Radeon 10 Vega Mobile integrated within the APU, we also ran some of the graphics tests after disabling the dedicated chip. 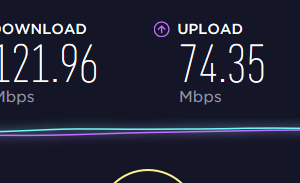 Here’s what we got, but again, keep in mind the results should be higher on units that are able to run at full clock speeds. 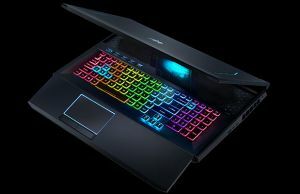 The real question is how the Radeon 10 Vega versions of this laptop compare to the Intel / Nvidia MX150 configurations available out there, and while I cannot give a definite answer based on this sample, I can say that the Nvidia combo comes on top in games based on the other reviews available online. At the end of the day you’ll probably find this entire section frustrating and even useless, with all these inconclusive results that should differ on the retail versions, but unfortunately that’s the best we could get from the sample Acer provided for us. I’ll try to update the article in the future if we get another test unit, yet there’s no guarantee it will happen. 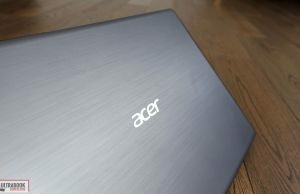 In the meantime I suggest to check out other reviews as well if you’re interested in this AMD configuration of the Acer Swift 3. 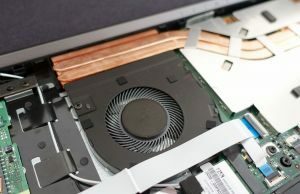 The cooling solution uses a fan and two heatpipes that spread on top both the CPU and GPU. The fan is active all the time even with basic everyday use, but it’s barely audible in a quiet room ( (35-36 dB, with the ambient noise level of 33 dB) and not at all in a normal office environment. It’s worth noting however that the fan does occasionally ramp up with multitasking for a few seconds, but quiets down quickly afterwards, still you’ll probably hear the occasional bursts. With gaming the fan remains quiet as well, averaging around 40-41 dB at head level, which the speakers will easily cover up. 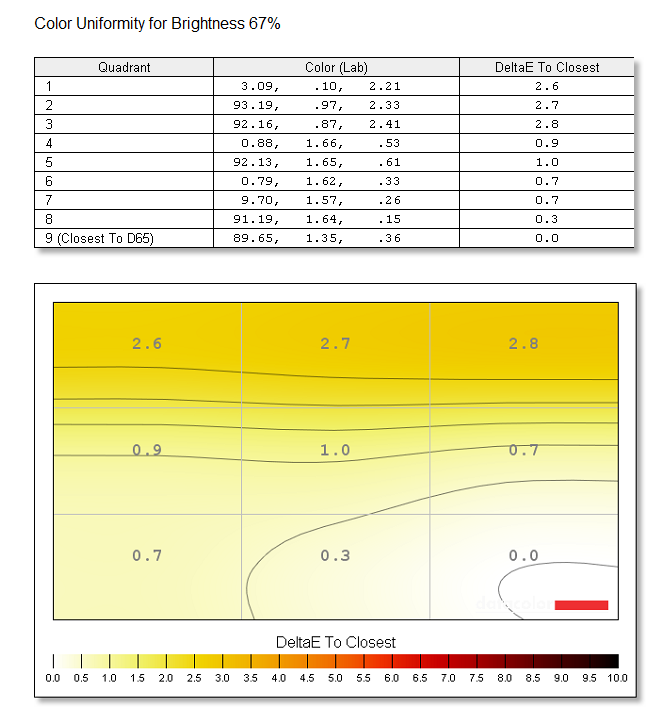 As far as outer case temperatures go, here’s what we measured on our sample. 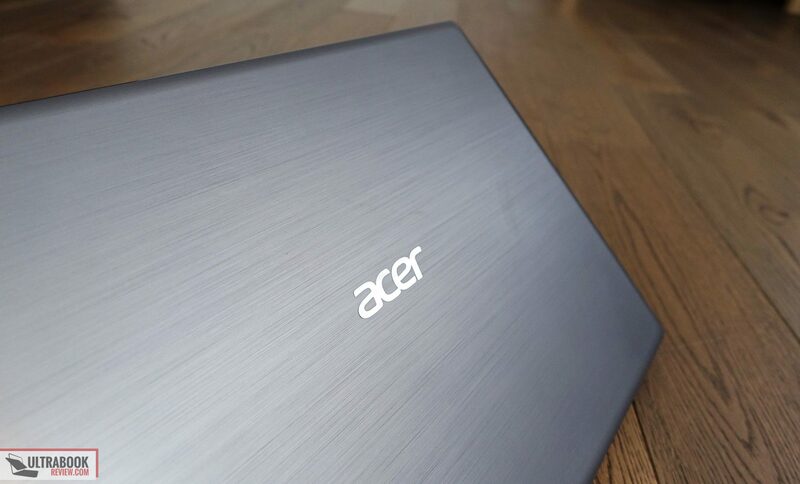 For connectivity Acer went with the Atheros QCA6174 module that includes Wi-Fi AC and Bluetooth. 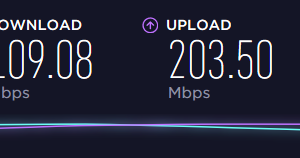 It’s not the fastest performer out there, but it works fine for everyday use both near the router and at 30+ feet with one wall in between. 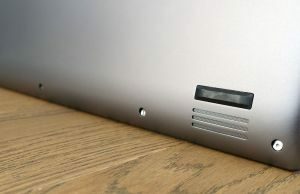 For audio you’ll find two speakers placed on the laptop’s bottom, towards the front. They’re fairly loud (up to 82 dB at head level) and don’t distort at high volumes. The sound quality is decent and clean, but don’t expect much bass. 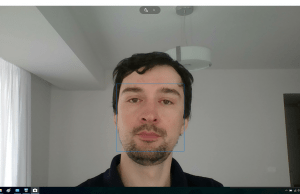 I’ll also mention the webcam. 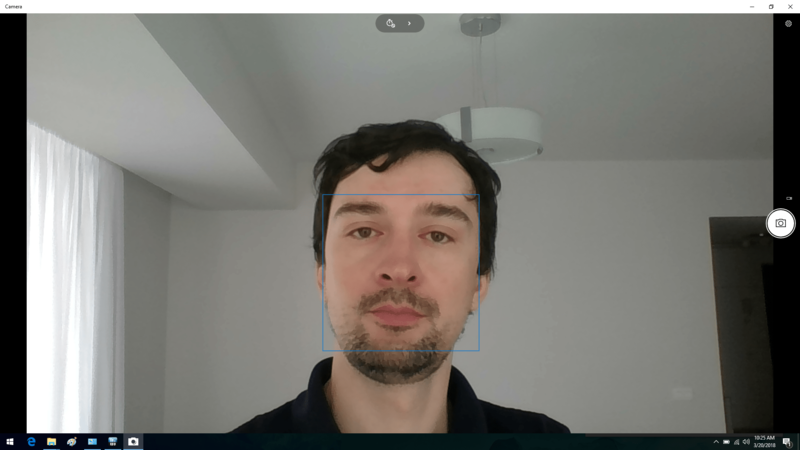 It’s placed on top of the screen, flanked by two microphones, and is fairly mediocre, but should do fine for some occasional Skype calls in a properly lit room. 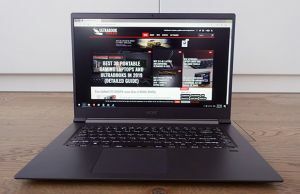 Acer puts a 48 Wh battery on this Swift 3, which is pretty standard for a mid-range budget laptop, but still a little smaller than what some of the competition offers. 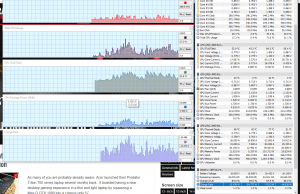 14.6 W (~3 h 15 min of use) – everyday browsing in Edge, Balanced Mode, screen at 50%, Wi-Fi ON. 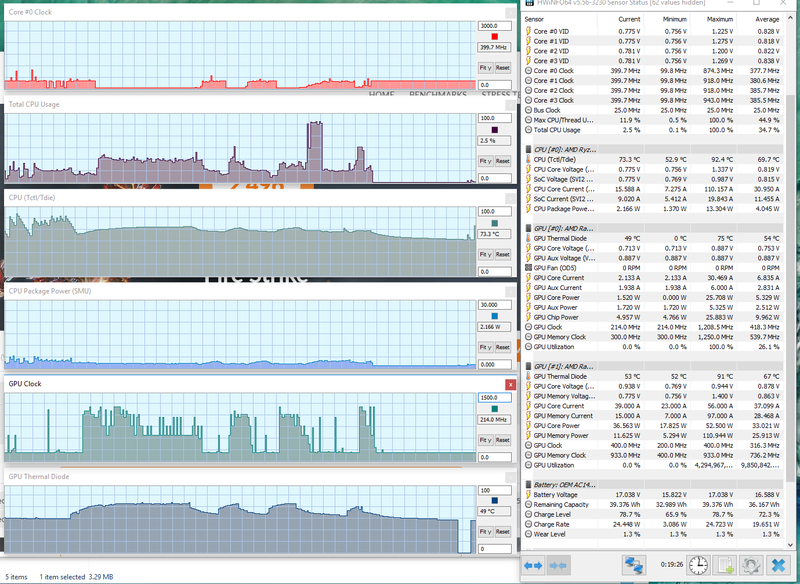 It’s important to note that this sample is roughly 15-25% more power hungry that the similar Swift 3 with Intel and Nvidia hardware. Normally I’d say we can’t draw conclusion on this sample, but other reviews mention similar or even wider gaps between the AMD Raven Ridge builds and the existing Intel KabyLake-R alternatives. So while these 14 nm AMD APUs are a significantly more efficient than their previous 28 nm hardware, they’re still a fair amount more hungry than the 15 W CPUs Intel puts on the table. The AMD versions of the Acer Swift 3 are available worldwide at the time of this post. 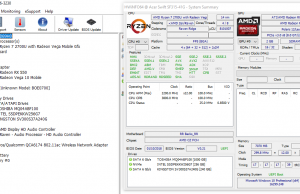 AMD Ryzen 7 2700U APU with Vega 10 Mobile graphics, 8 GB of RAM, 512 GB SSD – around $949. 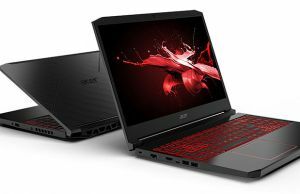 These two are also available in Europe, for between 750 and 1000 EUR, but over here Acer also offers the Radeon RX540 configuration for a little over 1100 EUR. Follow this link for more details and up to date info on the available configurations and their prices at the time you’re reading the article. 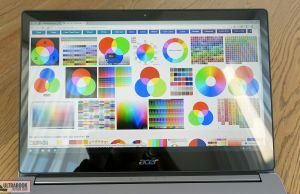 I can’t draw final conclusions on this AMD version of the Acer Swift 3 based on this sample that did not perform to the best of the platform’s abilities. However, based on the few other reviews of these Raven Ridge builds available out there (one, two), the AMD APUs match and even occasionally surpass the existing Intel KabyLake-R platforms in terms of multi-core performance, while they outmatch them when it comes to the performance of the integrated GPUs (Vega Mobile vs UHD 620). 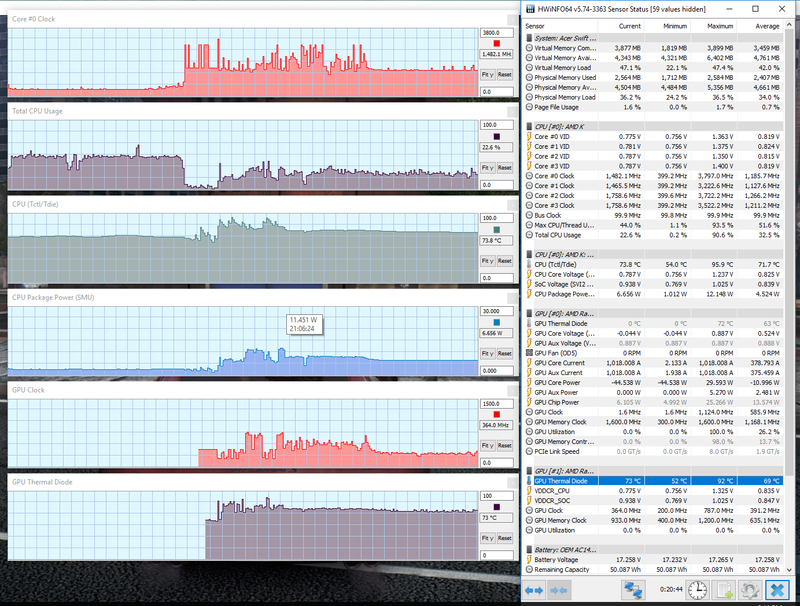 However, that’s not going to matter as much on the Swift 3s, given that the Intel configurations are all paired with Nvidia MX150 graphics. 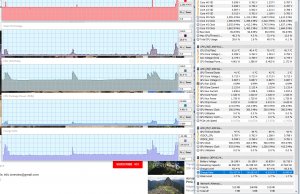 The AMD models still trail behind the Intel variants when it comes to energy consumption with everyday tasks like browsing and watching movies and so on. 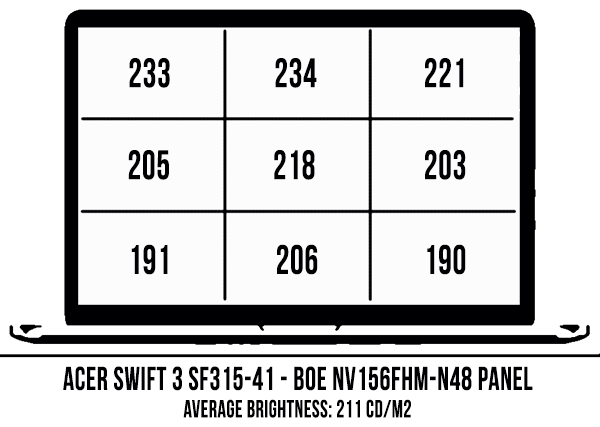 On top of that, there’s also the issue of the RAM being soldered on these AMD Swift 3s, while the 15-inch Swift 3 SF315-51 models come with two accessible memory DIMMs from what I know and can take more than 8 GB of RAM. 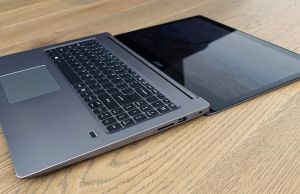 Hardware aside, the Swift 3s are fairly well made computers with good keyboards and decent, yet rather dim and unnecessarily glary, displays. 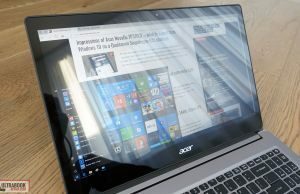 But this article is not about whether the Acer Swift 3 is a laptop worthy of attention, that’s without a doubt, it is about whether the AMD variants are worthy alternatives for the Intel models and the answer is “perhaps” and depends a lot on how much the AMD models will drop in price in the following months. 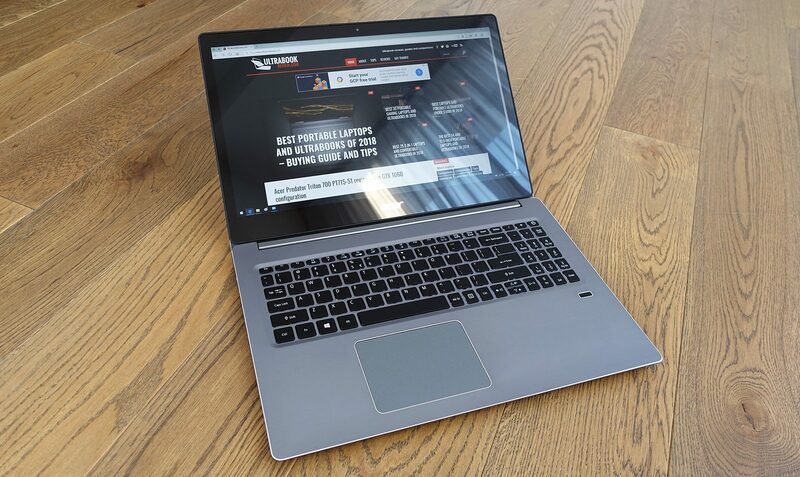 Right now, as of late March 2018, you can get the Swift 3 with the Core i5-8250U processor, Nvidia MX150 graphics, 8 GB of RAM and 256 GB SSD for around $800 and even less, which is just marginally more than the base level Ryzen 5 + Vega 8 AMD configurations, but overall a more efficient solution with better gaming abilities. You can read all about it in our detailed review over here. 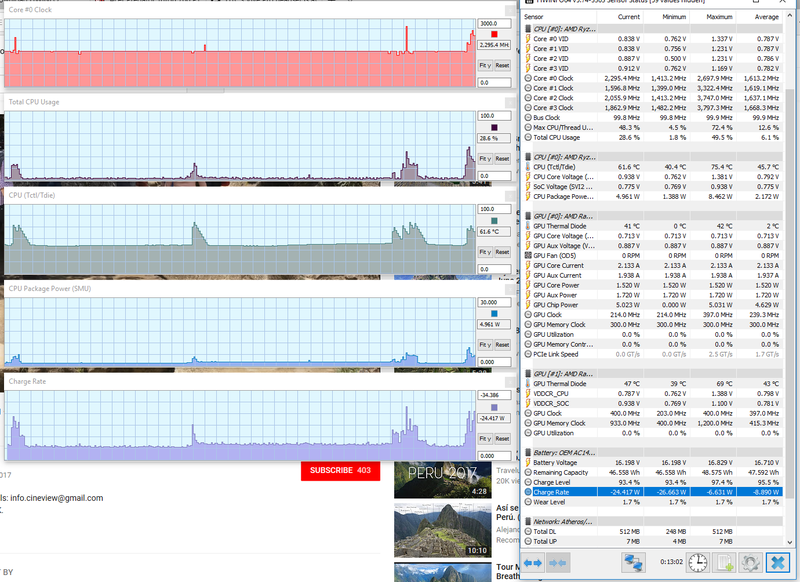 That’s why I’d pass on the AMD option for now. At $650 or less though, the AMD variant could make sense for those of you interested in a good all-round 15-inch laptop for everyday use and not that much for gaming. All in all, it’s surely great to see AMD finally competing in the thin-and-light segment once more, but Intel have stepped up their game with KabyLake-R and the soon to come Coffee Lake hardware. And while AMD are much closer than they’ve been in recent years, I feel they’re still the underdog for now and need to compensate with aggressive pricing in order to be competitive. Anyway, that’s pretty much all I have to say about this Ryzen 7 2700U version of the Acer Swift 3. Let me know what you think about it in the comments section below and get in touch if you have any comments or anything to add. 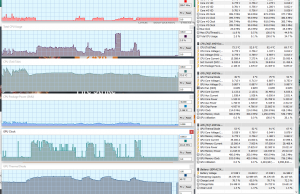 Swift 3's battery life is disappointing even for a low-end series from low-end focused brand. So far all credible reviews seem to converge on the fact that Ryzen mobile is much more power hungry compared to the 8th gen Intel ULV CPUs. 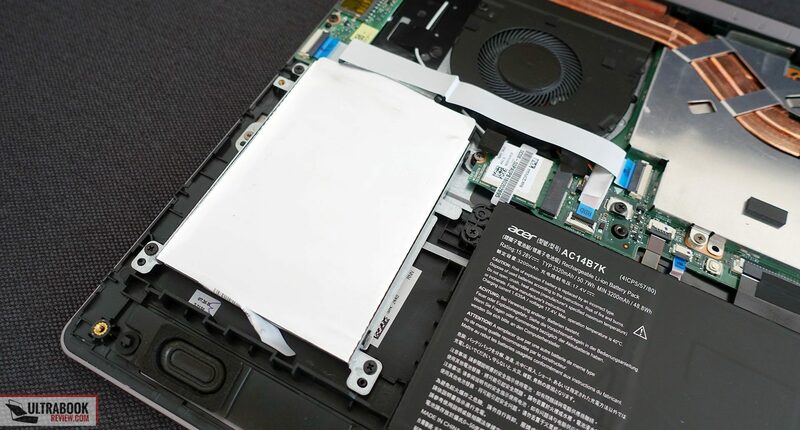 In Notebookcheck's test of Lenovo Ideapad 720s 13, the 2500U variant lasted 3 vs 10 hours with 8250U on the same 48 Wh battery. Then there's the dGPU which doesn't even come close to the level of GTX 1050 Ti+. I guess I honestly expected more. 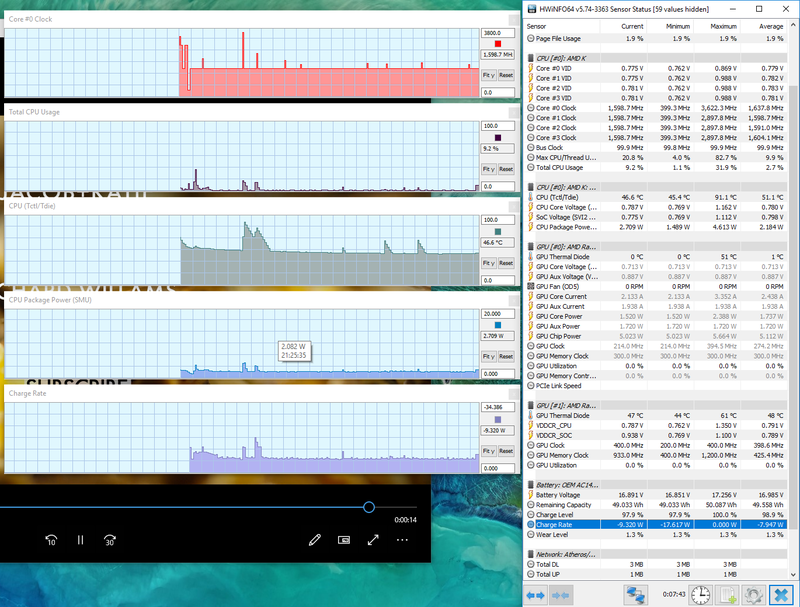 I think the consumption is an outlier as I have a 2700u equipped Dell and it has quite good battery life (7+ hours in normal web/office use). 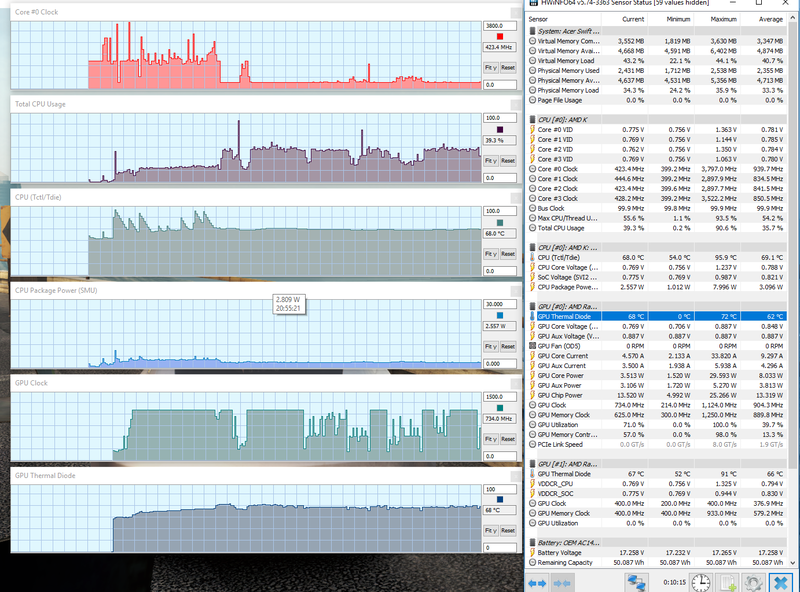 That's with a 42Wh battery. 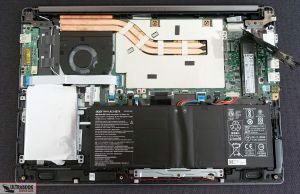 This laptop makes almost no sense – the RX 540 is around the same power as the Vega10 built into the 2700u, so why put a discrete gpu in that's not any more powerful? 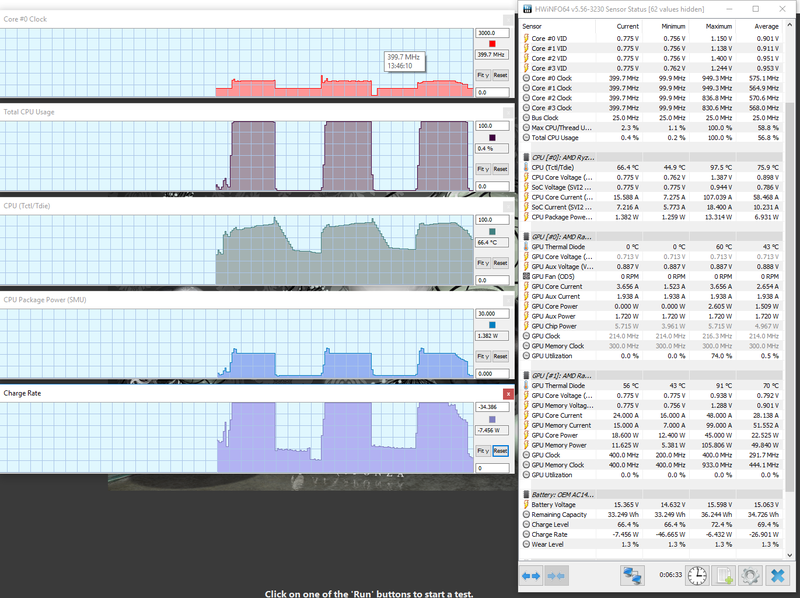 The FPS you're getting vs the mx150 is around the exact same differential a 2700u gets vs an mx150 without the dgpu. The only way it makes sense is if AMD is planning to allow multi-gpu through driver and not through application (dx12 mgpu requires application support), but there is no mention of that being possible anywhere. 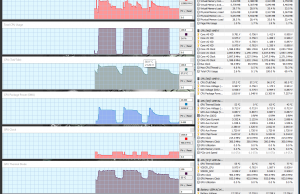 This is a really odd configuration.